Listen, I’m not the Nigerian lazy chef for nothing. I have days when I just don’t want to be bothered with cooking. Come see me see my ajebutters oh! I made onugbu soup and for some reason, I mistakenly added too much pepper; then my ajebutters started turning their noses up oh. As in “cant you eat small pepper? Why are you Nigerian? My fren!” Well, I would have loved to say that, but the love I have for my smallies didn’t let me. In fact I cooked some Ogbono soup for them and I used the boiling method to save time and energy. Wetin I no go do for these children…as in two soups in one day. I’m reminded of the days when mommy would cook Ogbono soup for us. Her favorite vegetables to use were Ugu(pumpkin) leaves or Onugbu(bitter) leaves. 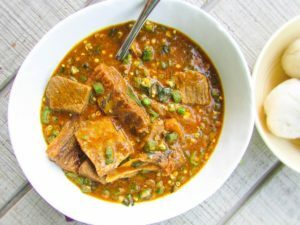 Fast forward to now that my son has some food allergies and these days, it seems like he can only truly enjoy Ogbono and Okra soup. Back to the recipe. Remember how they say “don’t cover draw soup.” Kai see scoping oh. You actually can. it’s only a myth. I mistakenly covered my cooking pot and viola! the soup was still okay. Like wow! This entry was posted in Fufu, gluten free nigerian recipes, Gluten free recipes, Healthy Nigerian, Healthy Nigerian Dishes, Healthy Nigerian recipes, Oiless recipes, Okra recipes, Okra soup, Soups, Uncategorized and tagged boiling method for ogbono soup, healthy ogbno soup recipe, Ngerian food blog, Nigerian recipes, Ogbono and Okra soup recipe, Ogbono and okro soup recipe, ogbono soup, ogbono soup recipe. Errrrrmmmm…The last time I tried using uziza in my ogbono soup, it tasted kinda bitter. Should it taste that way? You must have used utazi. Uziza is more of a spicy leaf. never came across your blog till today. i laughed real hard about the rice and stew and tomatoes stuff and then I learnt a lot. thanks and keep it up. I just got an electric pressure cooker(instant pot). Is it possible for you, the queen of the cooking shortcuts, come up with recipes that will take advantage of this contraption. Ndeewo. O Chim! I am so scared of pressure pots oh. I know I’m a bush woman, but I’ll think about it lol. Will spinach work in place of the other leaves? Or should I do without? 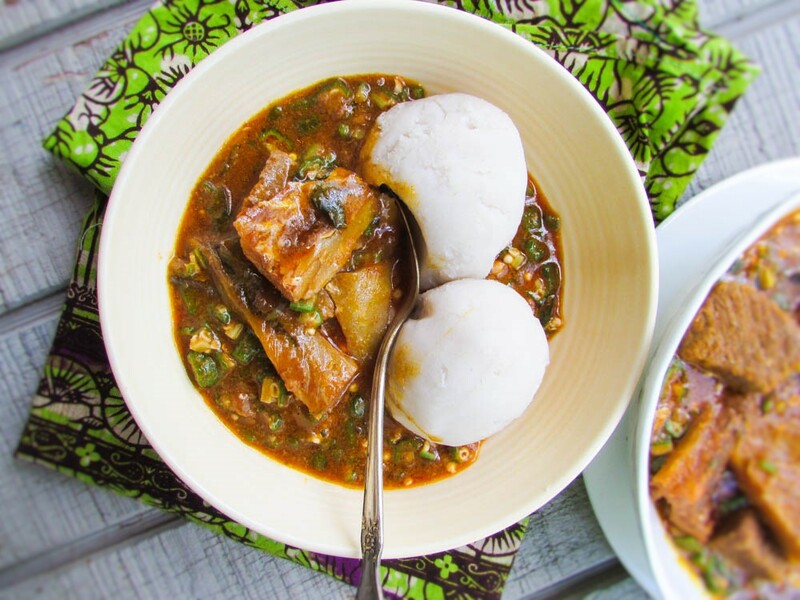 I have tried this easy ogbono recipe a few times now and it works all the time. Thank you! Thank you Yinka. Happy New year!